Bhavnath Mahadev Temple in the Junagarh district becomes the perfect venue for a spectacular carnival called Bhavnath Fair. The Bhavnath festival begins on the night of Maha Shivratri festival, a huge procession of sages, decked up in ornaments, seated on elephants, proceed to the temple and the sound of which reverberates through the entire district. Procession marks the commencement of an inflammatory religious ceremony. Local says that Lord Shiva visit this temple during the Maha Shivratri. Nearby the temple is a mountain range called Girnar, which is the abode of the nine immortal nathas (nine saints), and eighty-four siddhas (perfected masters who have achieved a high degree of physical and spiritual perfection), all of whom also visit the temple in their invisible spirit forms during Mahashivaratri. One can feel the festival vibes through the traditional Bhavai theatre. Before paying a visit to the temple, pilgrimages perform Parikrama of Girnar Hill, a hilly area nearby the Bhavnath Mahadev Temple. Pilgrimages serve food for free. Stalls of art and craft are set in the fair. 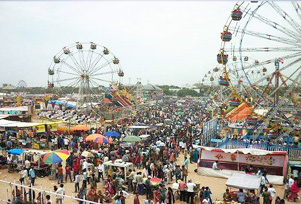 For the first time visitors, it is advisable to visit in groups at the fair takes place on the large scale and is brimming with revelry and mysticism.